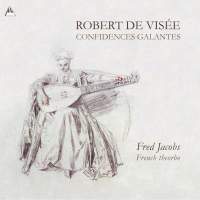 For his second recording devoted to the music of Robert de Visée, guitarist and lutenist to Louis XIV and colleague of François Couperin, Forqueray and Rebel, Fred Jacobs plays a massive, long-necked theorbo made for him by Michael Lowe. Thanks to a scrupulous student of the French master, we know de Visée used such an instrument for these works: Jean-Etienne Vaudry de Saizenay’s manuscript compilations and printed copy of his master’s music includes handwritten annotations revealing both the instrument intended and the tablature’s key. This is an important point, as the larger instrument in A was more often found in an orchestral and chamber context, while its smaller and younger cousin in D was used for solo music. And while de Visée did indeed play continuo before the king as part of La Chambre du Roy, it’s tempting to think he may have played some of the works featured on this recording by the king’s bedside, a habit he had grown accustomed to as a court guitarist in the 1680s. It’s also tempting to think he would have played with at least as much luminous introspection and subtle manipulation of muted colours as Jacobs displays here. These pièces de théorbe largely comprise typical French dances with some beautiful transcriptions by de Visée of works by François Couperin and Lully. But while the lighter courantes, gigues and gavottes have a peculiar charm all their own, it’s in the agreeably melancholic shadows of the sarabandes especially that both musician and instrument really come into their own.